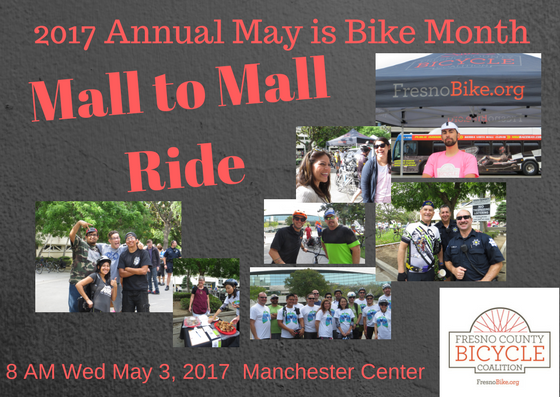 The 16th Annual FCBC Mall to Mall Ride is to be held Wednesday morning May 3, 2017. We will again be meeting adjacent to the Manchester FAX Transit Center between 7:30 and 8:00 am, followed by the Bike Month Proclamation with remarks by elected officials starting at 8:00 am. We will then take a leisurely bike ride down Blackstone Avenue accompanied by the Fresno Police Department Bicycle Unit. This year we will again be arriving at our downtown destination at the Mariposa Mall for coffee and light refreshments. Come out, ride a bike with us, and enjoy this fun, safe and free event.